1. I had a deadly melanoma removed at the age of five. 2. In hospital, after having my tonsils out as a child, my parents mistook another girl in the same ward as being me. They hugged her, and gave her my get-well goodie bag. 3. My parents left the country when I was fourteen, and didn’t return until I was sixteen. I was raised by another family during that time. 4. I started playing the drums because I thought I’d look cool, but quickly learnt they were a fabulous stress-reliever too. 5. My hubby is the first man I kissed. I have to say honestly that I enjoy my S'mores much more than I ever thought I would. Because in their 4 facts, and often in the make-believe of the fifth, the author becomes more to me than merely a colleague or an online friend. It's the way they can fill the outline of themselves so fully with only a few short words. And even when I thought I knew them pretty well, having followed their blogs or their stories, these tidbits, these little juicy pieces of wonder, will keep me supporting them for years to come. #1 Makes me a little teary to think any child has to go through that but so glad you are still with us today Miss Joanne! #2 That would have sucked! Maybe they were just so emotional they couldn't see clearly through their tears? #3 Wow! Your childhood was incredible, or perhaps incredulous? We'll let the followers decide! I'm thinkin' I wouldn't have minded at 14 to have been raised by another family, but then, I'm sure it sounds better to a teenager than in actuality. #4 I hooked up with my hubby the first time after a masquerade ball. He was lookin' mighty hot playing his air-drums in a tux at the next table. LOL I can see the appeal Miss Joanne! #5 Now, I'm thinking this can't be true. But I know you were one of the Nut "believers" in first love, so that's a hard call. I mean, not even a spin the bottle kiss when you were a tween? My first kiss was a guy named Eric who had a fabulous cowlick at his forehead. But I wasn't even thinking of that, only that first press of the lips. Sigh. So long ago, yet still SO important. Okay, so which one is the falsehood? Miss Joanne is willing to give away a copy of Highlander's Magic (Yes, please!) to one correct guesser. But, any correct guess goes into the draw, so guess away! I love, love, love (can't say enough) Scottish time-travel. I dream it will still happen to me one day. You can't go wrong with this book. Check it out! 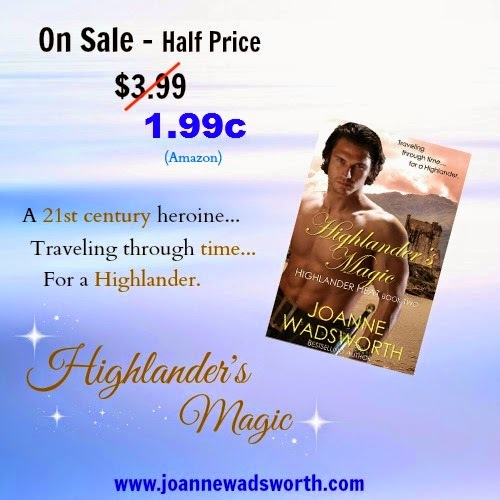 HIGHLANDER’S MAGIC on SALE June 22nd - 26th!! Good morning! Because it will be when you next wakey up. :-) Thanks so much for being a S'more Joanne. I've been to the Land of the Long White Cloud. One of my favorite places on earth. whoa, so hard!! Hmmm, I pick #4. Maybe you play a different instrument? But then again I could totally see you rocking out on a drum set! Thanks, Tera, for dropping by. By the way, (and this is totally off-subject) how do you all get your google pic to show here? Mine just won't. You're the winner, Tera. #4 was the fib. I'll email you and organise to get your prize to you. Hi Cd and Joanne. I'll follow any post about s'mores and sundaes, but even though I didn't get a sweet, this blog idea is too much fun! So tough to pick, but I'm going to go with #2. I'm probably wrong, but at least I got to peek at these hot scotties for a bit. That made the trip worth it! Hi Sharon, thanks so much for stopping by! Glad you enjoy the blog, and I'm happy to have you as a Nut and S'more whenever you are ready. Vroom-vroom! Hi Sharon, hot Scotties for sure. I love writing about these men. I even get to dream about them at night as I work through their storylines. Best. Job. Ever. I think I'll go with #2 as well. But these are all great fun facts ! Wow, totally stymied on this one! I can see Joanne rocking out to the drums, and I think she met her hubby young, so I can see that first kiss thing too. The others are throwing me, but I'm going to go with #2 as well. Hope it's not true, but wow . . . these s'mores sure make for some tasty thinking! Oh I like that! S'mores for tasty thinking :-) Very clever Miss Mae. Thanks for popping over! Oops...almost forgot: Joanne, I'm pretty sure our Gravatars don't show up because we're signing in with Wordpress IDs. Blogger likes Google Ids (which I do have). If you use that one, your pic will show up! Hey Gemma, I'm seriously jealous of your writer's retreat too. Keep those pictures coming. It’s time to announce the winner. Let me first break down those facts and tell you which one was the fib. #1 is true. I did in fact have a deadly melanoma removed at the age of five. That was a traumatic and terrifying experience, and something I’ll never forget. I’ve also had a fear of blood being drawn ever since that time, and I hate hospitals too. #2 is true. My parents did mistake another girl in the same ward as being me. She was my doppleganger, and even the nurses and doctors couldn’t tell us apart. I was though shocked as I watched my parents give her my get-well goodie bag. And when I hopped out of bed and tapped them on the shoulder to tell them who was who, the look on their faces was priceless. #3 is true. My parents were missionaries in Africa during my teens and left me behind for two years. Also, if you want to catch the whole story on that, it’s being featured on Dear Teen Me on June 30th. This is where I got to write a letter to my teen self, which I might add, was another entirely traumatic experience all in itself. #5 is true. My hubby is the first man I kissed. I met him when I was seventeen and we started dating at eighteen. We’re both the same age, and we got engaged at nineteen, and married the month following our twentieth birthdays. #4 is the FIB. Congrats to Tera Shanley on picking the right answer. I have never played the drums, or any musical instrument. I’ll email you and get your prize to you, Tera.